220 pages, 8.5" x 11"
In today's high-tech society, even the most advanced devices and systems are not failsafe. Tools can break or wear out, batteries can go dead, and all sorts of malfunctions can render the modern conveniences we rely on totally useless. If quick replacements of failed items are not readily available, the ability to improvise and adapt in the workshop suddenly becomes very practical. • HOMEMADE TOOLS—Make your own hammers, drills, screwdrivers, wrenches, pliers, saws, files, chisels, vises, clamps . . .
• EXPEDIENT REPAIRS—Perform sturdy repairs with ordinary glue, tape, cord, wire, dowels, nuts and bolts . . .
• MAKESHIFT CONSTRUCTION—Construct all sorts of functional items out of coat hangers, old car parts, 2 x 4s, wooden dowels, nails, rebar, coffee cans . . .
• USEFUL PROJECTS—Build a homemade forge out of an old barbeque; handle simple soldering jobs with a road flare; perform quick weld repairs with car batteries, jumper cables, and a pair of pliers . 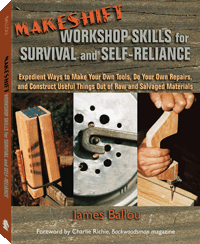 . .
Ballou also gives extensive instruction in makeshift metalworking, practical calculating skills, resourceful salvaging, plus dozens of practical tips for the craftsman or handyman who might need this information in an emergency or who simply enjoys learning about alternative ways to handle home workshop projects. Click here to read more about Ballou's second volume, MORE Makeshift Workshop Skills.